Maryashe Antin was born to a Jewish family in Polotsk (then Russia). She studied with private tutors before the whole family emigrated to the USA in 1894, settling in Boston. There her name was shortened to Mary. Helped by her teachers, Mary Antin completed grammar school in four years. 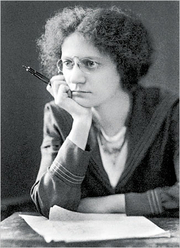 She began to fulfill her literary ambitions by publishing some poems in Boston newspapers, which made her a local celebrity and a symbol of immigrant achievement. She also published From Plotzk to Boston (1899), a collection of her letters, which earned enough to pay for her education at Girls’ Latin School (now Boston Latin Academy). In 1901, she married Amadeus William Grabau, a geologist, with whom she had a son, and moved to New York City. Mary attended Barnard College and Teachers College of Columbia University. At age 30, she wrote a bestselling autobiography, The Promised Land (1912) and went on a national lecturer tour. After the USA entered World War I, she lectured in support of the Allied cause, but her husband voiced his pro-German sympathies, causing a serious rift in their marriage. Mary Antin became ill and retired from public life. By 1919, the couple had separated, and the following year, Grabau left the USA for China. Mary Antin returned to Massachusetts, where she worked part-time as a social worker. Mary Antin is currently considered a "single author." If one or more works are by a distinct, homonymous authors, go ahead and split the author. Mary Antin is composed of 1 name.